One day makes a big difference when you’re a tropical cyclone. On March 28, Tropical Cyclone Joaninha still maintained an eye, and on March 29, once outside winds ramped up, the storm weakened quickly. NOAA’s NOAA-20 satellite provided an image of the storm that showed a large area of thunderstorms were pushed away from the center. 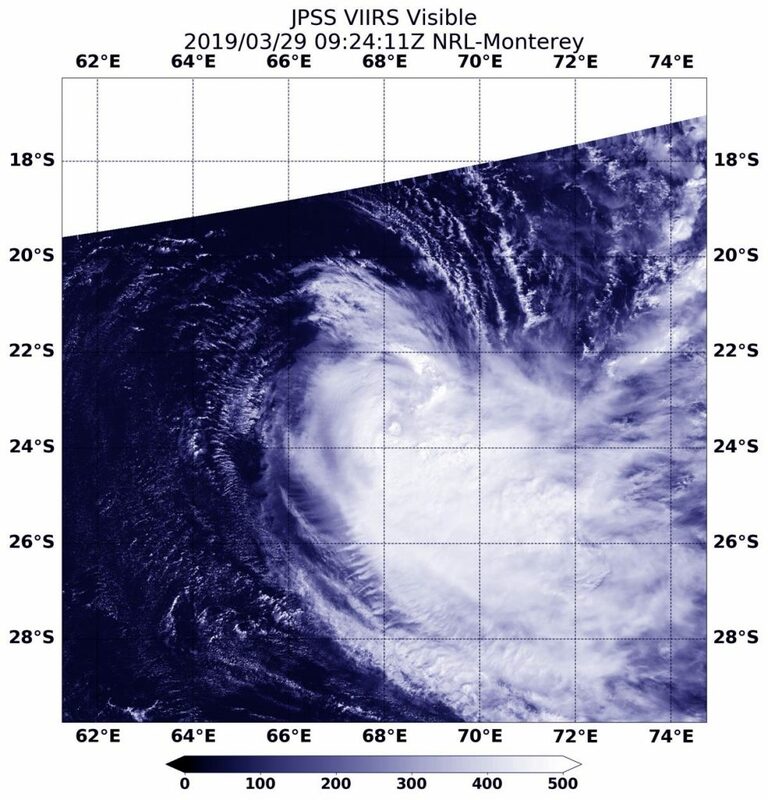 On March 29, 2019 at 11 a.m. EDT (1500 UTC), Joaninha’s maximum sustained winds dropped to 65 knots. It was centered near 23.6 degrees south latitude and 68.6 degrees east longitude. That’s approximately 655 nautical miles east-southeast of Port Louis, Mauritius. Joaninha was moving to the southeast. When NOAA’s NASA-20 satellite passed over Tropical Cyclone Joaninha on March 29 at 5:24 a.m. EDT (0924 UTC) the VIIRS instrument aboard captured a visible image of the storm. Satellite imagery showed struggling central deep convection (rising air that condenses into clouds and thunderstorms that make up a tropical cyclone) being pushed away from the low level circulation center to the east. Increasing westerly vertical wind shear above 30 knots continues to affect the system’s structure, leading to rapid weakening. That wind shear is forecast to increase, according to the Joint Typhoon Warning Center or JTWC. In addition, Joaninha is expected to move into sea surface temperatures cooler than the 80 degree Fahrenheit (26.6 degree Celsius) threshold needed to maintain a storm. Between the increasing wind shear and cooler waters, Joaninha is expected to continue to weaken.